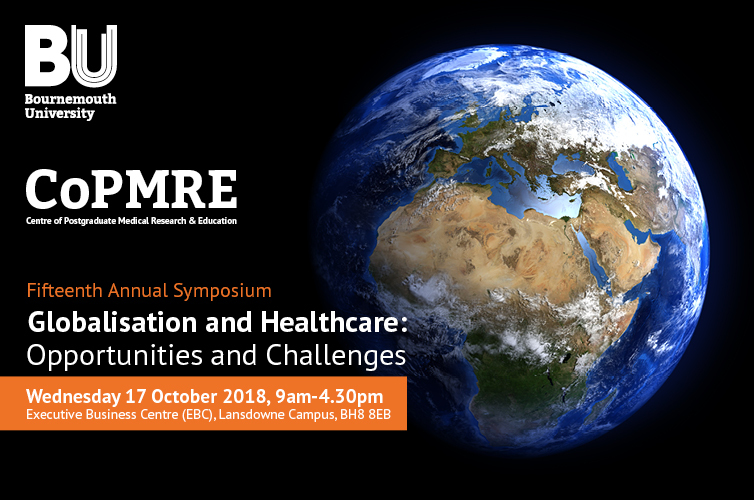 The Centre of Postgraduate Medical Research and Education (CoPMRE) is pleased to announce the Fifteenth Annual Symposium, Globalisation and Healthcare: Opportunities and Challenges. This symposium is suitable for primary and secondary care doctors, nurses and other healthcare professionals, academics, industry and anyone with an interest in medical research and education. Lord Crisp’s 2015 report, The UK’s Contribution to Health Globally Benefitting the Country and the World highlighted the need for working in partnership to improve health globally and the mutual benefit for everyone who engages in such work. This calls for greater alignment between academia, commerce, government and the not-for profit sector as well as integration of health into foreign policy. What lessons can developed countries learn from developing countries and vice versa?